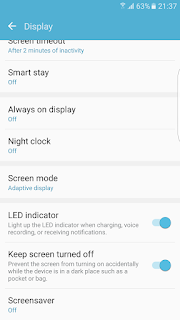 On Samsung devices there's been an outstanding issue of getting the default blue notification led and the only way to override it is to switch the screen on and off again. Light Flow has done this automatically for notifications that would cause this issue. 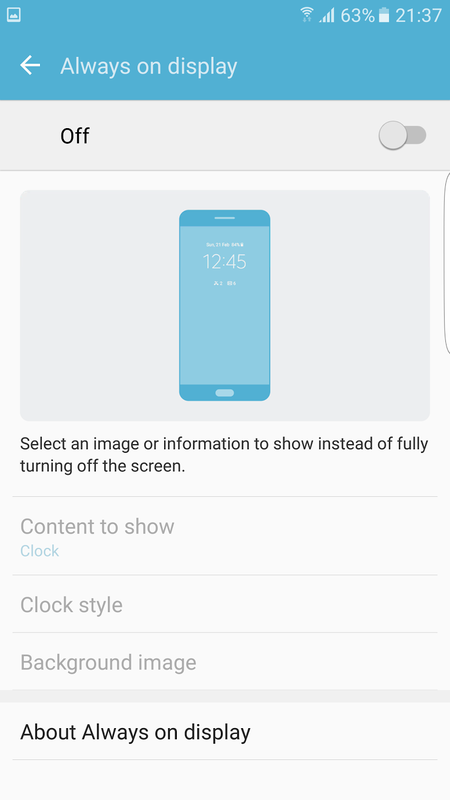 I raised the issue with Samsung several months ago and provided them with code and a sample app to show the issue. They confirmed it being an issue and sent it to HQ for investigation. Although they don't plan to bring the change to android 6 they have fixed the issue in android 7. 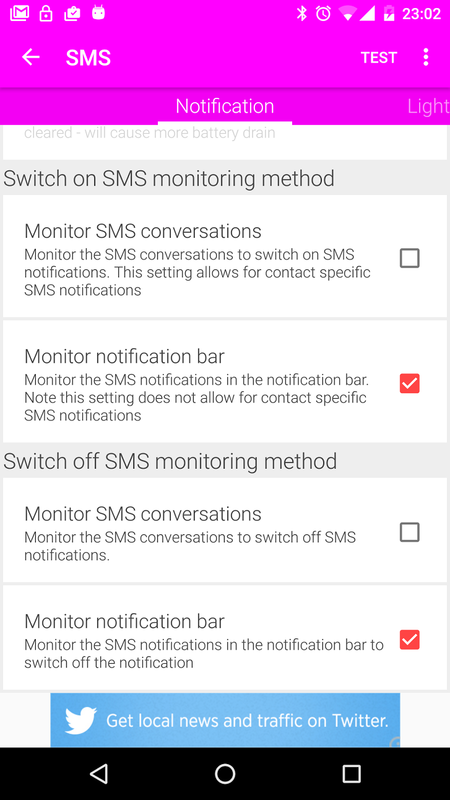 ->Light Flow->Notification Settings->Device specific and root->Samsung - switch screen on. 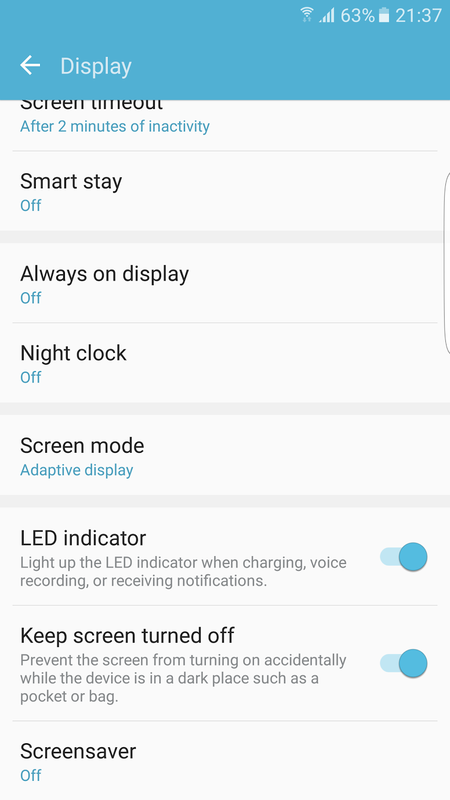 For Samsung devices running android 6 and above we recommend using Light Flow Legacy as it allows for the always on screen to work with the LED and it also doesn't require the persistent notification. There have been some reports of the phone app going very slow or the phone reporting it's going slow because of Light Flow on Android 7. If you are having problems after upgrading from Android 6 to Android 7 try going into your phone settings. Select Storage and "Clear data"
This will reset the app to its default state, but will hopefully resolve the issue. Light Flow should work on the S7 and S7 edge. The workarounds for Android 6 are not required in android 7, but you may have to clear the apps data if your phone upgrades from 6 to 7. This will reset the app and should fix issues that some users may be having after the upgrade. Samsung workaround. When it's enabled the yellow box will show "disable workaround" as it'll currently be enabled. If you have any apps which allow controlling the LED in their settings, make sure you switch that option off. e.g. Facebook, whatsapp, twitter, Skype all have settings that can be switched off. If you get a blue led override the correct led for these then so far the only option seems to be in lightflow to set the "switch screen on" option for these notifications. 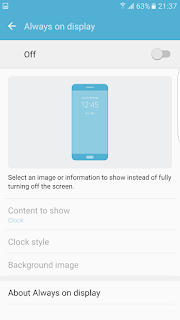 You can set a small screen on time such as 0.3 seconds which seems to fix the issue. Due to the workaround there Are A Few Side-Effects For Light Flow Controlling Apps Where The Native App Is Raising A Notification. If the notification is expandable and has buttons then if the button doesn't launch the app then the notification will persist. For example Gmail shows an "Archive" and "Reply" button. If you press "Archive" the archive process will happen but the notification will still persist. Just swipe away to clear it. For the "Reply" button, when it's pressed enters Gmail to reply and therefore clears the notification automatically. If an app can normally remotely clear a notification (for example when you view a Gmail on another device) this notification won't automatically clear. Note that all these side-effects only happen for apps without the option to switch the led off that would normally show one. Are you still seeing a blue led when you've selected another color? This will usually when system/stock apps raise a notification such as the messenger app, missed calls etc. Some users have reported that going into lightflow for these notifications and enabling the "Switch screen on" option helps ensure the LED ends up the correct color. Why do Messenger notifications not always show? The samsung sms app works a little differently to most other messaging apps. as shown in the screenshot above and see if that helps. 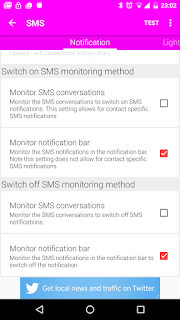 Note that with these settings contact specific sms notifications will not trigger. If you want them to we'd recommend using a different messeging app such as EvolveSMS which allows you to switch off the LED control in their app.